Beopgyesa Temple, Jirisan, Sancheong-gun, Sunday 8 September, 8:30am. Breakfast is again in the kitchen, and as usual (because I’m a foreigner unused to sitting on the floor) I’m allowed to sit with my back to the wall. I’m encouraged to stretch my legs out straight, and pummel my thighs and massage my knees, which are already stiffening from the descent. The ondol is efficient: almost too hot to bear. The breakfast is a repeat of supper the previous evening, but somehow more welcome after the morning’s exertions, the rice in particular seeming to find pockets in my stomach which I didn’t know were there. I had not felt particularly hungry when I sat down, but got steadily hungrier as I ate. After eating our fill, we take a stroll round the temple precincts. The sky is clearer than our last visit in April last year, and the views are beautiful. 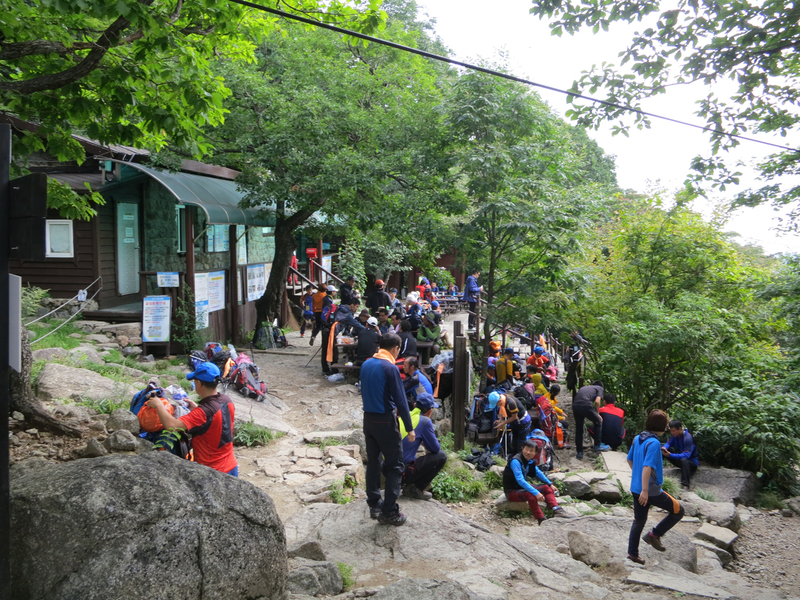 Korean mountain expert and Goodwill Ambassador for the entire Baekdu-daegan, David Mason, places Manggyeong-sa on Taebaek mountain in Kangwon-do as the highest temple in South Korea, and next according to him comes Myohyang-am, also in Jirisan National Park like Beopgyesa, but over the provincial boundary in Jeolla-do. The latter is a mere hermitage (-am) rather than a temple (-sa) so maybe it doesn’t count. But in email correspondence with me Mason stands behind the claim that Manggyeong-sa is the highest temple. Beopgyesa does not quite have the precarious location of Jeongchuiam, another temple in Sancheong-gun which clings to the rocks high up on a hillside, but still the location is dramatic. An irregular and steep stone stairway connects the lowest buildings (the administrative area: the kitchen, washing facilities and offices) to the highest (the main shrine), via the guest accommodation in between. Alongside the stairway runs a small stream which is barely a trickle in the dry season but which can turn to a torrent within a couple of hours given a bit of rain. According to the Cultural Heritage Administration website, the temple is said to have been built by a Buddhist Monk, Yeongijosa, in 544 CE. Yeongijosa seems to have been a prolific temple-builder, because the foundation of Daewonsa (548 CE – on the eastern slopes of Jirisan) and Hwaeomsa (544 CE – to the southwest) are both attributed to him. In common with many Buddhist temples in the area, it suffered in the Japanese invasions at the end of the 16th century and again during the Korean War, and most of the temple buildings are newly reconstructed. But a plain three-storied pagoda has survived. It stands on a foundation of natural rock, a method of construction which leads to the conclusion that it was built in the early Goryeo period – thus not contemporaneous with the temple’s original foundation, but still the oldest part of it which remains. Each body and roof stone consists of a single stone and wide corner pillars are carved on the bodies. Each roof stone is rather thick and has a three-stepped cornice under it. On the ornamental top, the shell-shaped stone is laid but it seemed (sic) to be made later. Using natural rock as the foundation of the pagoda was popular after the Silla Dynasty. (says the Cultural Heritage Administration website). 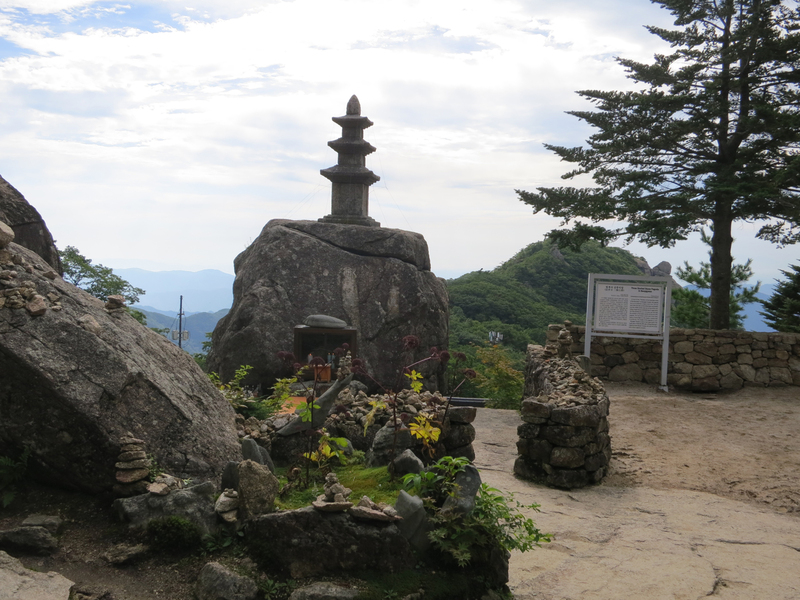 This simple stone pagoda, officially called Beopgyesa Samcheungseoktap, is Treasure No 473 in the Cultural Heritage Administration’s system. 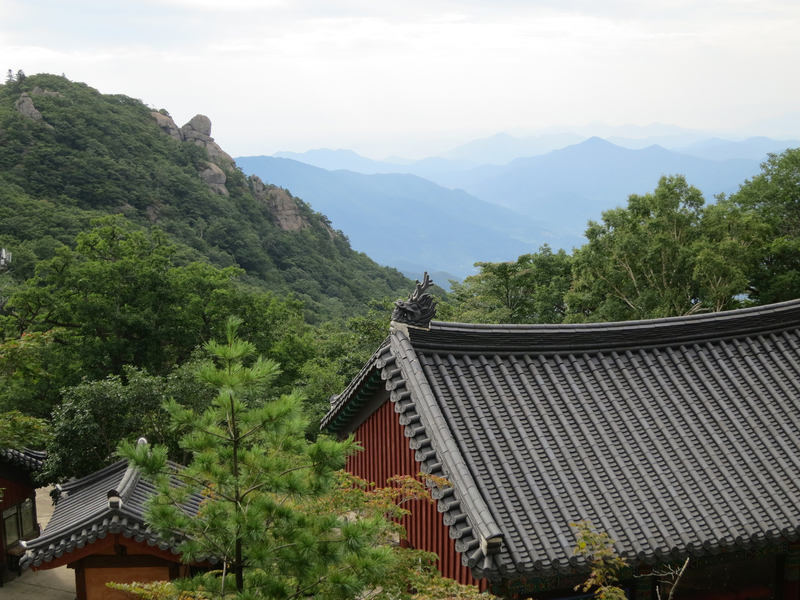 It is at the top level of the temple, close to the main sanctuary, and from which there are views through the clouds to another shoulder of Jirisan’s Cheonwangbong peak. 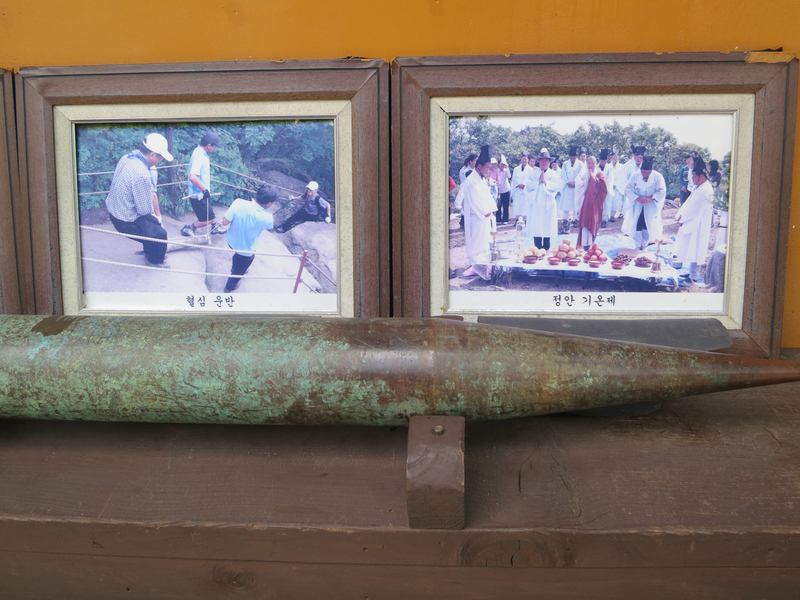 In the lower levels of the temple precincts, outside the administrative area beside the stairway, is a memory of Japanese colonial times: a meter-long steel pin which had been driven deep into the rocks of Jirisan. Controversy surrounds the exact purpose of these pins. The official Japanese story is that they were used to assist with a geological survey of the Korean peninsula. But many believe that they have a more sinister purpose: that they were placed by the Japanese deliberately to disrupt the gi, the geomantic energy, of the Korean peninsula, and thus break the spirit of the Korean people. Bearing in mind the many different ways in which the Japanese aimed to break the Korean spirit during the course of the colonial occupation this latter view has something to recommend it, though no direct documentary evidence has yet come to light. Nevertheless, the Chosun Ilbo has a photograph of Japanese soldiers, together with what appears to be a shaman-like figure, taking part in some form of ceremony in front of one of these metal spike on Baekdusan – the northernmost extremity of the Baekdu-daegan. This does not seem to be a photograph of a geological expedition. After our sight-seeing tour we take coffee with the senior monk, who shows us a brief video of views of the temple and the Jirisan region on her PC. As we turn to leave, we notice above the entrance to her office a photograph of the sanshin-je held one spring at the altar at Cheonwangbong. There seemed to be a crowd of at least a hundred onlookers witnessing the ceremony. Maybe one day I’ll return to see it in person. 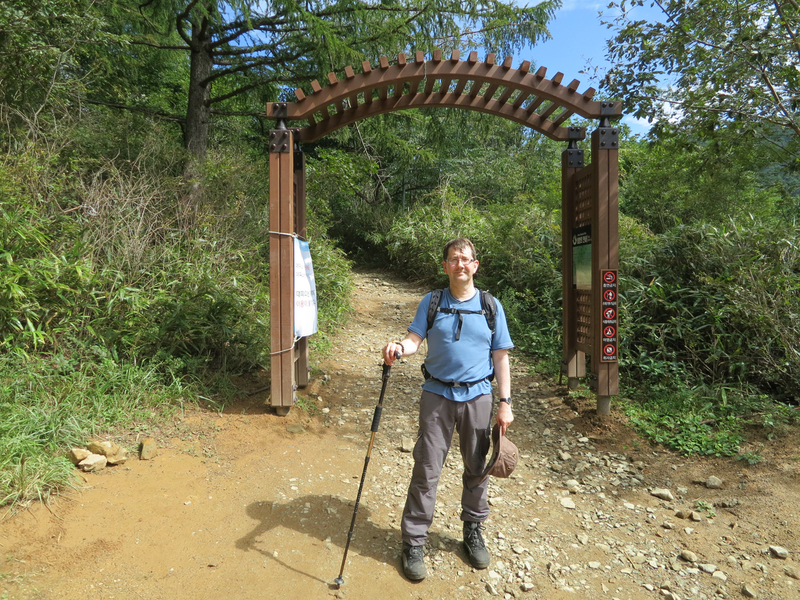 We ring Kyung-sook to arrange a rendez-vous at the end of the trail, and set off for the next leg of our descent. We are now mostly in the forest and we have fewer opportunities to see the view. The day is getting hotter and we have shed the extra layers that we put on at the top of the mountain. I’m really thankful for the stick which Mr Yoon had brought. My right knee is beginning to feel the strain, and as I try to put more weight on my left leg, that knee starts to complain as well. But they would be complaining even more without the stick that was bearing a lot of my weight. I would feel the effects of that the next day, with aches in my upper arms and shoulders, but I’m sure it saved greater pain in the lower limbs. At the bottom of the trail. Thanks to Mr Yoon for the hiking stick. By the time Kyung-sook arrives in her car at the bottom of the trail I’m exhausted and the legs are becoming painful, but I’m content that the body has more or less survived the challenge. There’s a rosy sense of achievement, not just at having reached the top of South Korea’s highest mountain on the mainland, but also at having joined the ranks of Koreans to have got up at a silly time of night to witness the dawn. Any aches and pains I was going to suffer were a price well worth paying. In Search of Japan’s Feng-Shui Stakes, an amusing article inspired by stories of these metal stakes. The Future of Korean American Literature, a talk by Heinz Insu Fenkl, contains reference to romours (reported by Minsoo Kang) of Japanese geomancers attempting to block Korea’s national gi.